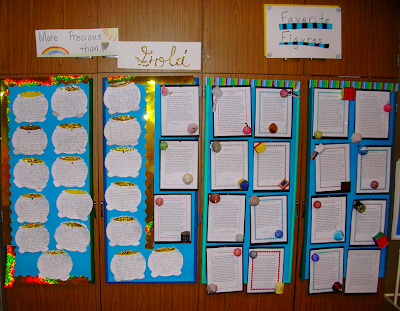 Mrs. Yollis' Classroom Blog: Welcome to Our Classroom! Pot of Gold Essay? Favorite Figure Essay? 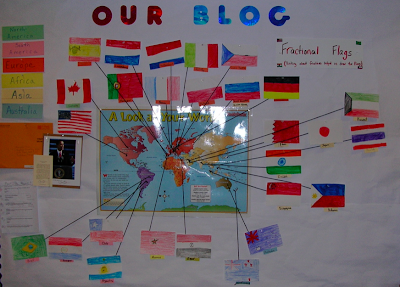 Our Blog's Visitors and their Fractional Flags? Four Habitats and the Animal Reports? Here is a close up of the Biographies! Washington, D. C. and the Three Branches of Government? Hi guys! it's Jack, James' brother. 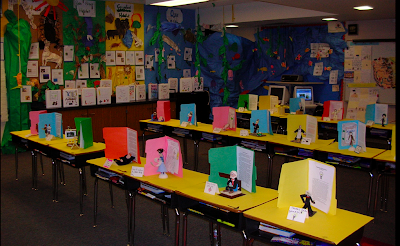 My personal favorite was the biographies because they were each individualized and show something about the person who wrote them. My family loves your blog, and we have visited on open house. Thanks for inviting us to your open house! All of your projects were very impressive, but I think my favorite to view was the biographies. It was so much fun to look at all of your famous figures. You are very creative kids! Way to go! My favorite was the animal reports. I love them because of the typing we did and because of the animals we stuffed. My favorite were the animal reports! What was your favorite piece of art work at open house? Thanks for asking me about my favorite. It is hard to choose because there were so many great projects. I liked the Biography Time Line the best. 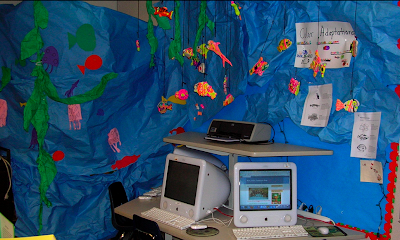 This project incorporates reading (research), history, writing, and art. Each sculpture looked like a lot of thought and work went into it. Arranging the room like a time line was also interesting. As I walked the line and thought about all the historic people, I was wondering how many of them might have known one another. Interesting thought, no? That is very very interesting. I remember that Henry Ford and George Washington Carver knew each other! Do any of your people know each other? That is so weird how people know each other from the reports. I think the biographies were outstanding and I wonder if I'll do one next year. How about you? I especially loved the Favorite Figure stories. Because instead of just putting the pictures up we actually made the 3D figures. I was really impressed with all the work everyone put into their biographies. 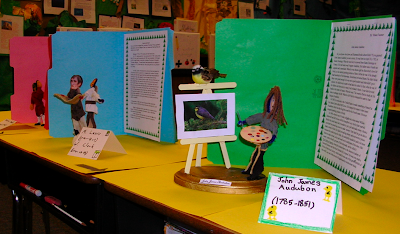 It has been fun looking at the details in the figures everyone made to go with their biography. Great Job! Thank you for sharing all of your wonderful projects at the Open House. We loved walking into such a vibrant and colorful classroom! Matthew's sister liked the animal project, especially the Sloth. My favorite was the Pot of Gold essays. It was so sweet to read what is more precious than gold to each of you and that you shared that with all of us. My favorite part was the animal reports. I liked them because we worked very hard on them, and they were informing. For example, I learned that blue whale is like three school buses long. I especially loved the Favorite Figure stories because instead of just putting the pictures up, we actually made the 3D figures. My favorite project was the animal reports. I liked how the rain forest put a water fall in it and that the ocean put jelly fish in it. Also it looked like James put a lot of effort into the blue whale. It was a lot of fun making the animal reports! I was really impressed with all the work everyone put in! What do you think about the work? I was impressed with everyone's hard work. I think the writing was the most difficult for people. Trying to vary sentence structure and choose the best verbs, adjectives, and adverbs can be a lot of time and require much thinking! I think YOU put a lot of effort into everything. Your comments on our blog are not only frequent, but always full of content. I noticed you compared a Halloween story character with the evil step-sisters! You are an example for all of us! We both adored the animal reports the most. So illuminating! We can't wait until summer, and though we want to have you as a teacher next year, alas we can't. You are the BEST teacher ever! Thanks for everything. P.S. How is our extra credit comment? 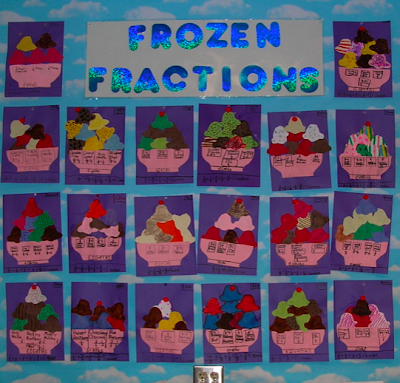 I loved making the frozen fraction. My mouth watered when I read the amazing flavors! Your classroom was fantastic on Open House night! I can tell that you have each worked very hard this year and you should be very proud of yourselves. It's so difficult to choose a favorite project but I'm going with the kelp forest with the clay fish. I had the feeling I was under water and it was great. The kelp forest also led me directly into the animal reports which were fascinating and very well done. Thanks for a great visit. My Favourite Open House thing was the Washington, D. C. and the Three Branches of Government? Our place where our Prime Minster Kevin Rudd Works in Canburra. Canburra is the captial city In Australia. Did you like on 2km's blog Kuda Learns 100 Things you really need to know? Did your class like Tyerell, Marcus, Me [Riley], Cam and Thomas's facts. If you want to look on The page of Leopold Primary School just click on the link below. If it not working just type the link and it will work. See you guys maybe your next blog you make. From Riley Coghlan in Miss McGeady's grade 2KM. I never got to ask my question when you talked to our class. I was wondering how old the cub is until its fully an adult? Thank you for all the interesting facts that you gave us about the Kodiak Bear. I had so much fun making the blog with you guys, and I can't believe all of the posts we have. My favorite part of Open House was the animal reports. I learned about habitats and their purposes. One more thing have a great summer! P.S All of the animal reports looked great! I was seriously in awe of all your hard work and acheivments since the beginning of the school year. I was especially touched by your time line sculptures and the time and effort you have put in to writing and creating them. They were all so impressive and skillfully done. I can't believe that third grade is almost over and at the same time feel grateful that Iman spent it with the most talented and wonderful teacher and classmates.